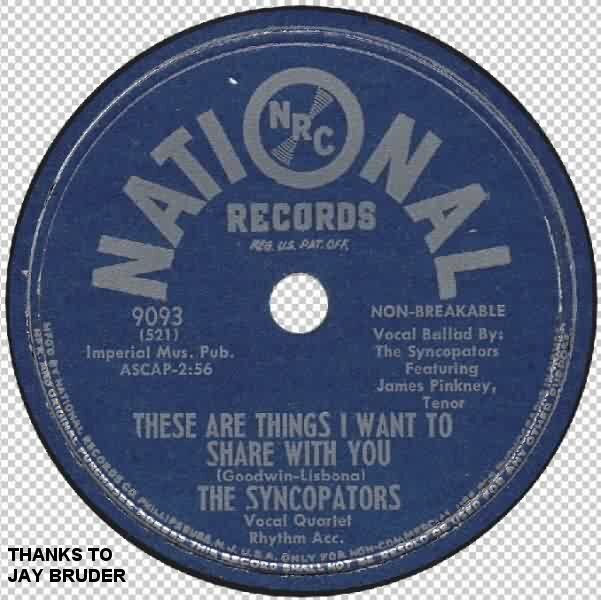 The Syncopators are one of my favorite artists, in spite of them only having recording four songs. But two of those were beautiful ballads that I can listen to over and over again. Forming shortly after WWII, the Syncopators started life as a street-corner group in the neighborhood of 5th and K in Southeast Washington, D.C. Walter Sutler said that they "came from the shadows of the Capitol." Their idols were the Ink Spots and the Charioteers. "We sang sentimental ballads - no shouting," said James Pinkney (no relation to Drifters' bass Bill Pinkney). 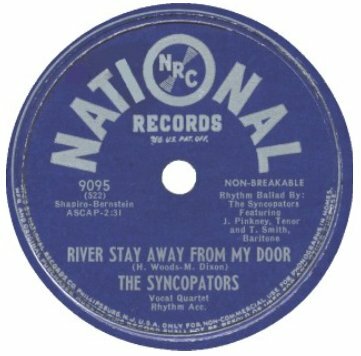 Although the Syncopators were young (17-18), they were very popular with older audiences because of their material and delivery. 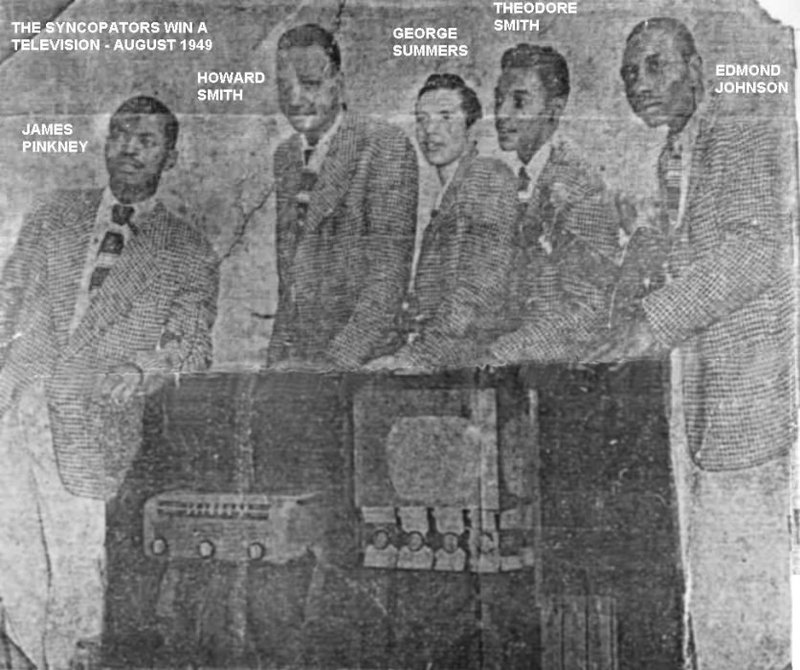 The group consisted of James Pinkney (lead tenor), George Summers (second tenor), Howard "Ghostie" Smith (baritone), his brother, Theodore Smith (bass, baritone and second lead), and Edmond Johnson (bass, baritone, and guitar). The Syncopaters [sic], quintet of Washington, who won first prize in the Sunday talent contest at Sparrows Beach, standing by their television console which was awarded by the Baker Appliance Shop, 1538 Pulaski St, Baltimore. The contest, a Battle Between Two Cities, was co-sponsored and emceed by Harold Jackson, disk jockey of radio stations WSID, Baltimore and WOOK, Washington. Afterwards, the group went to see Harold "Hal" Jackson, who was not only the MC of the above event, but a very influential DJ in the area, to see if he'd manage them. However, Jackson, who managed several DC groups at the time, was too busy to even see them. Instead, they turned to another DJ, Walter Sutler, of WINX (owned by the Washington Post). He agreed to manage them, but soon Hal Jackson became a co-manager. Since Sutler and Jackson knew Al Green, owner of National Records, they had him come to the Regal Theater in Baltimore, in September, to see the Syncopators perform; Green signed the group on the spot. Since there were no record companies of any size in the Baltimore/DC area, all aspiring singers had to travel to record. Thus, the Syncopators journeyed to New York for a session at Bell Studios. In October 1949, the group recorded four tunes: "Mule Train," "These Are Things I Want To Share With You," "River Stay Away From My Door," and "Out In The Cold Again." All were led by James Pinkney, except for "Mule Train," which was fronted by Teddy Smith. Their session was overseen by Howard Biggs, who had been the arranger for the Ravens (although by this time he'd left them for the Beavers). Phil Rose, who would subsequently own Glory Records, was also involved. In October, 1949, National issued "Mule Train," backed with "These Are Things I Want To Share With You." 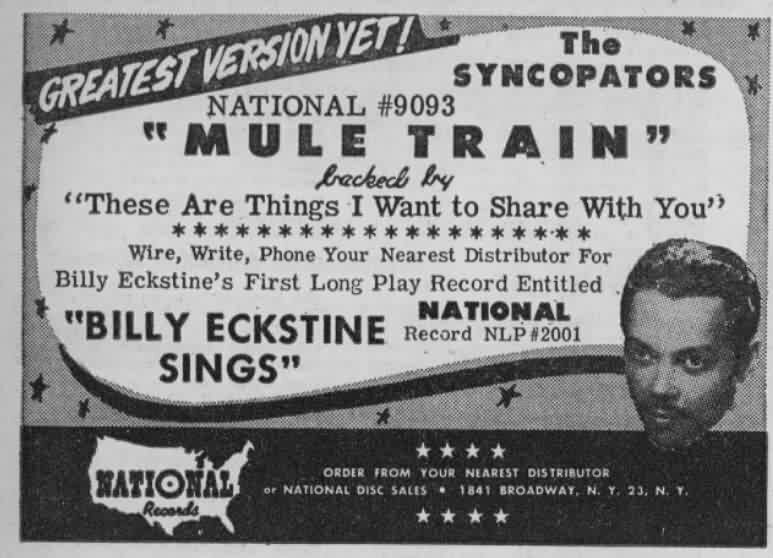 This, according to Walter Sutler is the story of "Mule Train": The song (written by Johnny Lange, Hy Heath, and Fred Glickman) was owned by Mercury Records, whose president, Irving Green, just happened to be the son of National's Al Green. It was decided to let National have the rights for about a month to see if one of their artists could do anything with it. The song was given to the Syncopators, and their version is actually the original recording. It's a wonderful story; it isn't true. Two separate articles (the Ottawa Citizen - November 2, 1949 and the St. Petersburg Times - November 10, 1949) claim that the song had been written four years previously. It was first recorded, said one article, by Ellis "Buz" Butler "for a small recording outfit" (unnamed). In 1949, someone decided it would make a good musical number for the Republic Pictures western "Singing Guns", to be crooned by Vaughn Monroe, who starred in the film. Although a huge November 5, 1949 Billboard article said that Decca "had acquired the old [Buz Butler] master before the tune broke loose", I can't find out anything about the original pre-1949 recording (which may have been recorded years before, but not released at the time). In addition, every copy of the sheet music that I've seen has a copyright date of 1949. The Butler master was entered into the Decca books on October 7, with a Los Angeles master number. However, its Billboard review didn't come until December 17: "Here's the disk that launched a thousand 'Mule Trains' - the first waxing of the epic. It's unquestionably the definitive rendition, but will probably take the dust of the others." A Newsweek article from an unknown date in 1949 (which I can only see a snippet of) says of Butler's version, "It was recorded then by Buz Butler but not released. ", so it's possible that it really was several years old, but had never been heard by the public before Vaughn Monroe's radio show. And the madness began. Frankie Laine recorded it (on Mercury), followed by Monroe himself (RCA), Bing Crosby (Decca), Burl Ives (Columbia), Gordon MacRae (Capitol), Tennessee Ernie Ford (Capitol), and Gene Autry (Capitol). Nor can we forget Buz Butler (accompanied by the Cass County Boys, on Decca). All of these versions had been released by the time of the November 2 article, although some of them are now incorrectly dated at 1950. Not mentioned was Nelson Eddy (Columbia, which one reviewer called the "sorriest record of the year"), Mac McGuire and his Harmony Rangers (Rich-R-Tone), and Arthur "Guitar Boogie" Smith (MGM). You will notice that a certain R&B group's version is missing from that list (as is the fun one by Woody Herman and the King Cole Trio, released later in November on Capitol, and a Spanish version, "Tiro de Mulas", by Lalo Guerrero con el Mariachi Imperial, released on Imperial in January 1950). Many of these fall into the category of "Why Did They Do It? ", Of course, the simple answer is: their record companies told them to. That's always the answer when it seems like Big Bucks are out there to be made. Still.... Compared to some of these, the Syncopators version was pretty good. However, the definitive version of the song for me remains a toss-up between Spike Jones' "Chinese Mule Train" and Mickey Katz' "Yiddish Mule Train". Billboard's magnificent summary in their November 5 article was: "And a genuinely unknown oddity about the whole mess is that for a sterile animal, the Mule certainly bred a million records in a hurry". However, there was worry in the industry that the public would quickly tire of the song, because there were so many versions with so much airplay, Disk jockeys cooperated by cutting back on plays to prevent this. It was hoped that this would be the song that spurred consumer record buying for the upcoming holiday season. Bob Hope quipped that, "It was played so many times in one day, Petrillo [head of the Musicians' Union] was elected president of the Teamsters Union." Mercury had released DJ versions of the Frankie Laine disk in time to be played on the Al Jarvis show (KLAC) on October 24 (he'd also be the first to spin the Bing Crosby and Vaughn Monroe offerings); the Syncopators' version didn't even hit the Advance Record Releases listing until November 19. This wouldn't be a strategy for ensuring success. Even the accompanying ad says "1st Quartet Version," not "Original Version." 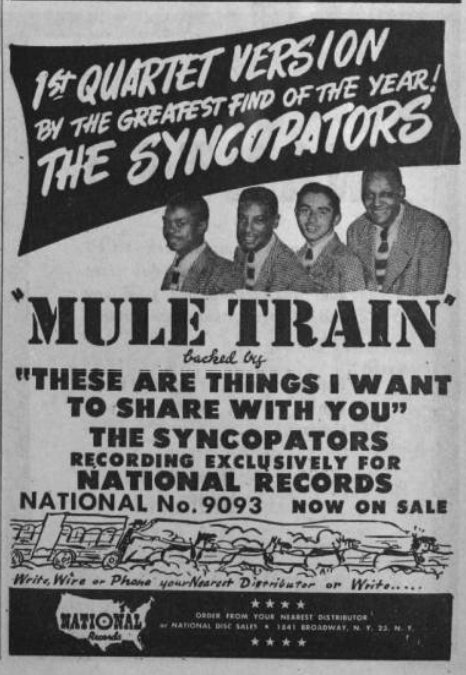 (The label itself says "The Syncopators' version of Mule Train," not something it would have said if it were the original version.) Note that when National prepared the ad for "Mule Train," the group was shown as a quartet; to make everything fit nicely, they'd cut James Pinkney out of the group's photo! Decca, on the other hand, tried to do the right thing. 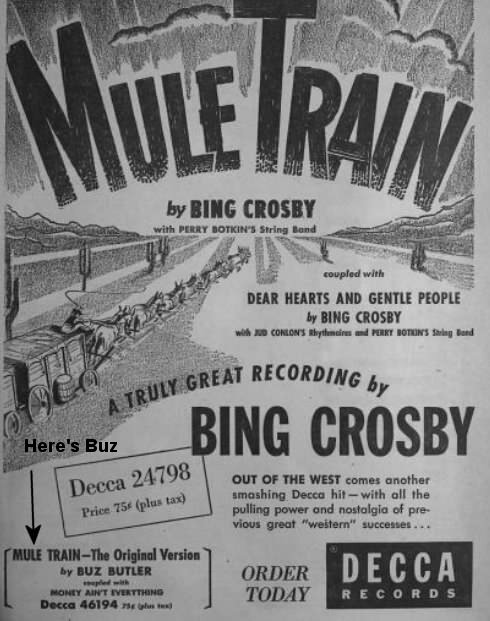 In the huge, full-page ad for Bing Crosby's version (which they knew would sell), they mentioned Buz's version (which they knew wouldn't), as the original, at the bottom. The record was reviewed on November 19, 1949. The beautiful "These Are Things I Want To Share With You" only received a 62, while "Mule Train" trailed far behind, with a 50, saying "will hardly compete with major versions." Other reviews that week were for Andy Tibbs' "I Know," Savannah Churchill's "I'll Never Be Free," the Blenders' "I Can Dream, Can't I," and the Beavers' "If You See Tears In My Eyes." In a stroke of brilliance, Sutler sent a copy of the disk to President Harry S Truman. The telegram that was sent with the record was a fun piece of silliness. As reported in the Baltimore Afro-American of November 12, 1949, "they" said that they were "inspired" to send the president the first group recording of the song "after they realized that the donkey is the mascot of the Democratic Party." 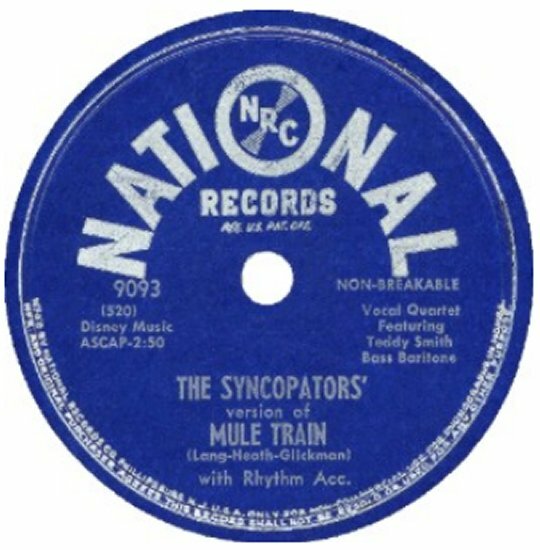 It sailed on: "We, the Syncopators, hope that while this record about the 'Mule Train' is being played nationally, people will think of the donkey, mascot of the Democratic Administration, then team up and co-operate to make the years remaining under your guidance peaceful and prosperous." At least the paper was realistic about it: "The stunt proved to be a popular one from a publicity standpoint because the INS and UP news services picked it up at the White House and sent it out on their wire services giving the local group a tremendous publicity break." However, at the time of the article, Truman hadn't even seen the record because the Secret Service was still busy screening it. (After all, too much exposure to R&B could be lethal.) The record, it said, was being pushed by Jerry Strong at WINX and John Massey on WWDC. The White House eventually acknowledged the record in a letter. This was actually only one of the many gimmicks thought up by public relations flacks. For example, Mercury boosted the Community Chest by using a real mule train along Hollywood Boulevard (advertising Frankie Laine, of course). Decca did the same for Crosby in Fresno, California. Mercury also got the teamsters' union to endorse Laine's version as the union's official song. Here's some of the stunts pulled for the Tennessee Ernie Ford version: DJs received a plug of Brown's Mule tobacco, with a note thanking them for their plug of the song. Record dealers got a small whip for their counters; when it was touched, it played a few seconds of Ford's version and a short announcement advertising it. Operators (juke box owners) were mailed stickers, advertising Ford, to put on the jukes. When the dust had settled, here's how "Mule Train" fared: Frankie Laine's version hit #1; Bing Crosby's, #4; Tennessee Ernie Ford's, #9; Vaughn Monroe's, #10; and Gordon MacRae's, #14. The song was truly a phenomenon. However, there was little in the way of promotion from National, and sales soon trickled off. "These Are Things I Want To Share With You" was released a second time, a month later, with "River Stay Away From My Door" as the flip. It shows up in the Advance Record Releases on December 17, but doesn't seem to have been reviewed. However, the Sunday Herald (Bridgeport, Connecticut) from January 1, 1950 had this to say about the pairing in its Spins And Needles column: "The latter tune's ("These Are Things I Want To Share With You") so easy to take we don't blame the quartet's employers for recoupling it with the oldie." On the other hand, the St. Petersburg (Florida) Times called the pairing "pretty good." It isn't easy to spot (I probably wouldn't have), but Jay Bruder pointed out to me that the reissue used a different take from the session: the original was master 521-2; the re-release was 521-4 (based on the data in the records' dead wax). The Syncopators appeared at Harlem's Baby Grand, Baltimore's Regal, and DC's Howard (with Sammy Davis, Jr. in his first show televised from a theater). But then, Hal Jackson relocated to New York's WLIB. Although the Syncopators appeared on his "House That Jack Built" show, he no longer had time to manage them. Within months of their session, with no promotion, little management and some internal problems, the group broke up. 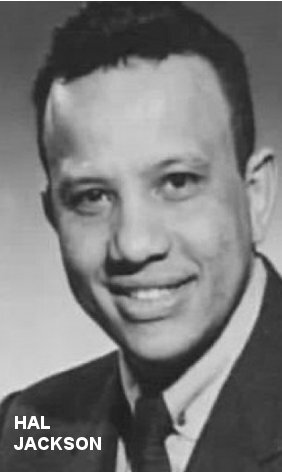 That the group disbanded so quickly was a blow to James Pinkney, since, when they were in New York, he refused to leave the group to become a soloist (he was once rated the highest tenor in DC). Although the Syncopators' sound was a take-off on the Ink Spots, they added a more polished background harmony. After the Syncopators' break-up. Pinkney tried his hand at being a solo artist, but nothing ever came of it. Bandleader Lucky Millinder held a talent contest in DC, which Pinkney won by singing "Don't Take Your Heart From Me." The first prize was to be a New York recording date and a feature role in a movie. Although Millinder confirmed this by letter, he never sent for Pinkney and the deal fell through. Second lead Teddy Smith went on to become the bass player with the Horace Sliver Quintet. Although the Syncopators' career was all too brief, we at least have the legacy of their sole session. 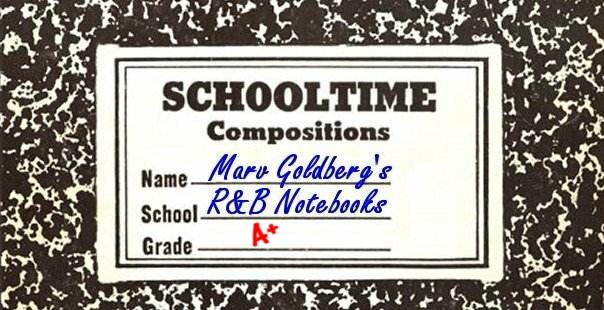 "These Are Things I Want To Share With You" is one of the most beautiful R&B ballads and "River Stay Away From My Door" is a lively treatment of the old standard.